In the mid 1960’s The Batik Inn used to be a favourite of mine. I would often ‘live dangerously’ and catch a bus outside of RAF Changi main gate and for a few cents take a death defying ride into Singapore city and then walk along Orchard Road to The Batik Inn. I can no longer recall the actual entrance to The Batik Inn but passing down the side of the building one came into their ‘garden’ laid out with tables and fringed, to us Europeans, by exotic trees and shrubs. Here I would sit dreaming away the warm tropical evenings with a Tiger beer, absorbing that most heavenly of fragrances from the Frangipani and listening to quiet, seductive oriental background music as table top candles flickered and danced in little jars. In spite of being in the city limits, moths and bugs abounded, fluttering about the garden and occasionally one was treated to a glimpse of an Atlas Moth as it silently and majestically winged its way across from table top to table top. Leaving by the same way, alongside the building, one walked through this arch way and under those very thoughtful third and forth lines of ‘The Ballad of East and West’. My many memories of Orchard Road do not end here.... with my girlfriend at the time, we often walked bare footed along Orchard Road during the day and frequented a little Italian coffee house (not the Magnolia Bar?) and I’m pretty sure it was near C.K.Tang, where would order ice cream with our coffee. Our favourite ice cream was known as ‘Cassata’, I seem to recall the coffee house may have been called ‘Sorrento’s’, but I can no longer be 100% sure. More memories of Sembawang, this time via email from a friend from Australia (I presume). 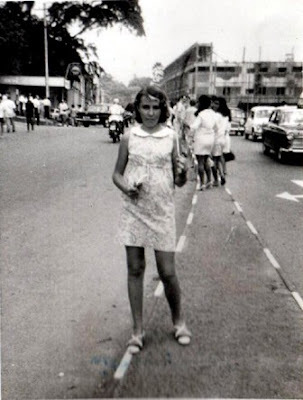 I just stumbled upon your blog about Singapore in the 60's and 70's and felt a wonderful sense of relief - Singaporeans still remember the 'Kampong Days'!! I was a member of the ANZUK Force serving with them for about two-and-a-half years - in retrospect, perhaps, the most educational and significant years of my life! I spent a bit of time at Changi and used to catch the bus along Tanah Merah Road - not sure if it was actually, Tanah Merah Besar …. also lived in the barracks at HMS Terror, a house in Sembawang and lastly at Woodlands. I just visited Singapore in 2008 and was dismayed to [and shocked and impressed by the vastness of the changes - culturally as well as economical - though Lee Kwan Yew was always going to make a big statement after getting booted out of Malaysia] find the village just out of Sembawang where I used to go and learn TKD was nowhere to be found - I think maybe the railway station was built on that site!! And the Sembawang Strip [probably you never went there, but just about every western serviceman would have had a beer there] looked so sad and lifeless. It came as a shock - because even though I have spent many months in Vietnam, Malaysia, Indonesia, Thailand, Cambodia and Laos .. and saw the changes in those places - they did not have the same level of emotional impact as I experienced in retracing my early soldier years in Singapore. I doubt now you even have the Indian piercing festivals etc.. Anyway .. please excuse my rambling .. congratulations on your initiative - it is very worthwhile. PS – I think the village that Terry mentioned must have been Chong Pang Village and the ‘Sembawang Strip’ must be referring to the row of bars that I blogged about in my previous post. 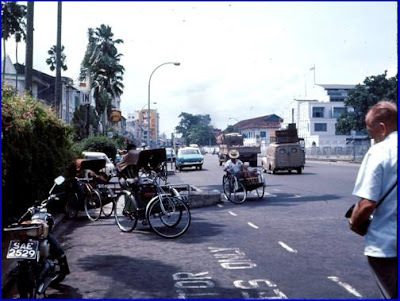 This 1967 photo of the same row of shops by A. J. Allen is from Memories of Singapore. Doesn't seem to have changed much over the past 43 years. OK, here’s a quiz to test your knowledge of Singapore. Below are two photos of houses which I was quite surprised to see. Where is this place? It is quite difficult to see houses like these nowadays. I think Victor has blogged about such buildings in the Alexandra Road vicinity. 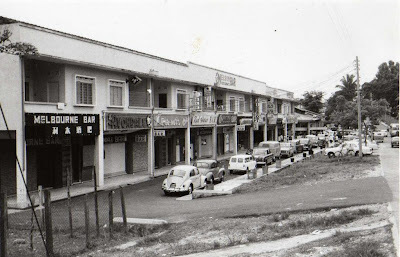 I have enjoyed reading several posts by my fellow nostalgia bloggers like Philip Chew, Thimbuktu, YG, Victor and Jerome Li sharing their memories of Sembawang. 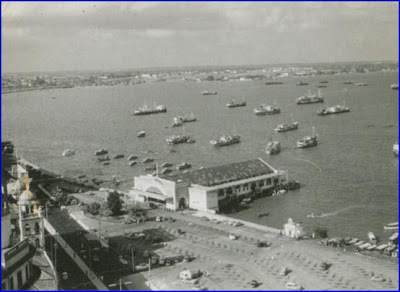 Although Sembawang is not ‘my territory’, I do have some memories of that place which I too would like to share with you. But, unlike my other stories, my memories of Sembawang don’t go back very far. In fact they are relatively recent, going back to the early nineties when my kids were still quite young. At that time, I often brought my family to places like the Changi Beach, Kallang River, MacRitchie Reservoir, West Coast Park, Seletar Reservoir and Sembawang Park on weekend evenings. My wife and I wanted our children to spend more time in the outdoors than in air-conditioned cinema halls and shopping centres. Recently, I read an article about research done in Australia which says that regular exposure to the outdoors is good for children’s eyesight. Maybe that’s the reason why all my three children do not need glasses – at least not until recently when my youngest started to use them – which is quite unusual by Singapore standards. At Sembawang Park, we would visit the jetty and the kids liked to play on the beach. As night fell, we often went for dinner at a zhi-char coffee shop located in a cluster of HDB flats near the Sembawang Community Centre. On the way, we would pass by a row of shops on the left some of which had bright neon lights which I assumed were bars. I was a bit surprised to see these bars because that stretch of road was quite dark and deserted. Furthermore, I thought these bars usually catered to the British military personnel who would have long left Singapore by 1990. I have not been to Sambawang area for a long time and have heard about the tremendous changes that had taken place there. And so when I recently had a chance to go to the Sembawang MRT station early one morning, I decided to go to Sembawang Park for my brisk walking exercise and check if these places were still around. As expected, I was totally overwhelmed by the transformation of what was once the Chong Pang Village and Canberra Road. In fact, as I drove along Sembawang Way, I missed the turn (it was still quite dark) and I ended up in Yishun instead of Sembawang Park. Anyway I was pleasantly surprised to discover that the block of shops that used to house the bars is still there. In fact I had my breakfast there. But I was saddened, though not surprised that the cluster of HDB flat near Sembawang CC had disappeared. As for Sembawang Park and the surrounding; it didn’t seem to have changed much. Still very peaceful and quite. In 1971, the Ministry of National Development met officials from the major oil companies in Singapore to announce a major decision. All petrol stations within the Central Business District (CBD) were to be phased out over a period of 30 years, with some having to quit immediately. In 1970 there were a total of 150 petrol stations throughout Singapore; 30 still remained after 21 were re-sited away from the city area. SHELL the main oil company was the most affected by the government’s ruling to re-site the bulk of its petrol stations away from the city area. Photo 1: SHELL station at Beach Road, opposite the former Beach Road Camp which would later become the future South Beach Hotel (circa 1968). Site is now occupied by Raffles LaSalle. 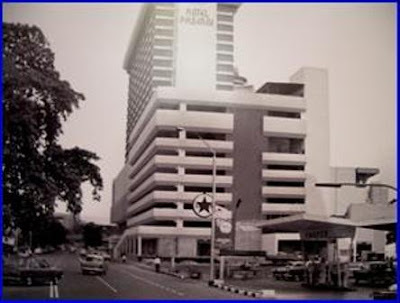 Ten years later, a public tender was called in 1982 for a petrol station at the Golden Shoe Multi-storey Car Park - bounded by Church Street and Market Street. The tender went to SPC. I am not sure for the change of heart but I believe this is the only petrol station inside the CBD after the last one at Springleaf Tower closed. Photo 2: SHELL station after the slip road from Tank Road into Oxley Rise. Later the site was replaced by the Oxley Flyover (circa 1968). In the background is Clemenceau Avenue towards Orchard Road. There were five key reasons for phasing out all petrol stations. 1) There were too many petrol stations in the city area rendering uneconomic use of expensive and scare land resource. 2) Petrol stations lie along busy thoroughfares and were seen as causing traffic hazards as vehicles move in and out disrupting a smooth traffic flow. 3) Not many were environmentally friendly; waste engine oil went into public drains. The road surfaces were often coated with black oily patches. Many were even aesthetically an eye-sore. 4) Petrol stations were fire hazard candidates because they were used to host the Seventh Month Festival. Something catastrophic could happen when giant size joss sticks and burnt paper offerings stood dangerously close to the fuel pumps. 5) New housing estates were built and it would be better when motorists obtain petrol services nearer to their homes. Photo 3: CALTEX station was at the corner of Killiney Road and Somerset Road (circa 1975). Now is occupied by ORCHARD CENTRAL. Petrol stations could be classified in three different categories; stand pump, petrol service station and full service petrol station. A stand pump was nothing more than a dual gasoline pump offering petrol and diesel. The second type, petrol service station occupied a bigger space and comprised of several pumps and sold various grades of fuel – Ordinary Petrol, Regular Petrol plus diesel. The third type was a full-service petrol station offered lubrication services, sold motor accessories and petrol. 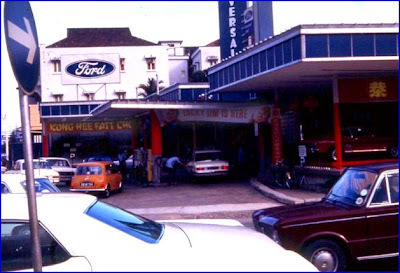 Photo 4: ESSO station at the corner of Mount Elizabeth and Orchard Road (circa 1976). TONG BUILDING has replaced the station. Geographically petrol stations were located at the city fringe area and those inside the city area, apart from those in the new housing estates and rural areas. There was a George Lee Motors Station at the corner of Clemenceau Avenue (now Clemenceau North) and Peck Hay Road. George Lee Motors can be categorized as the third type. A SHELL station along Tanglin Road, next to St Martin’s Apartment was the second type. A stand pump example was the one at the former site of the Overseas Union House before it was built. Did you know at the corner of Orange Grove Road and Orchard Road there used to be a SHELL station; now it is the Orchard Hotel? 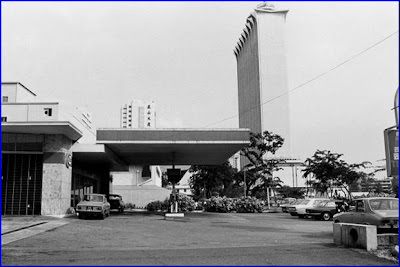 Photo 5: SHELL station at the corner of Penang Lane and Orchard Road, now Doby Gaut MRT Station (circa 1973). 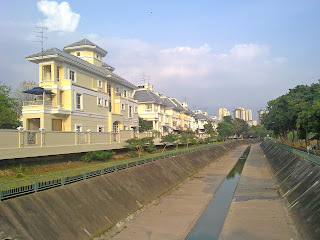 Penang Lane is in the foreground. Universal Car Distributors held the distribution franchise for Ford cars in Singapore. Photo 6: Stand Pump petrol station to the right of Clifford Pier in the public car park area (circa 1957). This station sold to motorists as well as water-boat operators. The public car park later became the Overseas Union House – housing the Neptune Theater, Bank National d’Paris and OUB. Is that all to the above list? Can you help me identify other locations inside the “Restricted Zone”? Did the government do the right thing in the 1970s? The government had a long term vision but in the early days, many did not agree. Yesterday’s petrol stations are now gone. Replacing them are modern shopping and office complexes and public parks. Most definitely there is less pollution and everything is clean. Photo Credits to the late Derek Lehrle, Donna Brown and William Rank. Thank you for all those wonderful memories. I am 58 and have never used a smart phone before. Although I am proud of the fact that I was one of the first oldies (pronounced ‘oldeee’ not ‘old die’) in Singapore to start a blog, and have in fact been roped in by the folks at Infocomm123 to be their Silver Ambassador last year, the thought of myself doing all those ‘cool stuff’ on a tiny handphone, where I need to put on my reading glasses just to read the text, isn’t exactly my idea of entertainment. However, recently I had the opportunity to witness the amazing prowess of these little gizmos and it changed my mind. I was at a Chinese New Year family dinner. As I chatted with my son and nephew by the koi pond, we spotted a huge, rather unusual-looking catfish. “That’s a red tail catfish”, declared my son, the ‘David Attenborough’ of the Lam clan. Not convinced, my nephew whipped out his mobile phone and within a minute was able to access a website displaying photos and details of this beautiful creature. He went on to demonstrate some other nifty things that you can do with a smart phone, like looking up a map. And thus I jumped on the opportunity to review the Nokia X6 when approached by Nuffnang and I am happy to report that it wasn’t that difficult to learn after all. However, I have to admit that for an oldie like me, it was a rather long learning process. I think if Nokia wants to market the X6 at seniors, they had better provide some hands-on training. Anyway, here are some of my impressions of the Nokia X6 (pardon the long introduction … I did tell you I was 57 going on 58 didn’t I?). Whilst I enjoy music, you simply won’t see me on an MRT train or running around the parks with wires sticking out of my ears. The only time I listen to music is when I am in my car, or behind my keyboard at my work station. Hence, I never took to MP3 players or downloading music onto a mobile phone. And the only time I listen to music on my mobile phone is when I have to wait for my kids. I would tune in to my favourite radio station; Gold 90.5 FM. But Nokia’s Comes With Music is different. It allows you unlimited access to millions of tracks which you can download onto your PC. For those who prefer your music to be mobile, the X6’s 32GB on board memory allows you to store 11,000 tracks onto the device itself. And what’s more, you get to keep everything you have downloaded on your registered PC or Nokia handphone. Now I shall have many more songs to listen to as I work, in addition to the limited number that I had ripped from my CD collection. Best part is, there are lots of ‘oldies but goodies’ music to suit my taste. And the sound quality is really good. Even the ring tone sounds good. I read in the March 3 edition of Digital Life that Nokia is giving away its navigation software Ovi Maps for use on its new phones. Once installed, the phone becomes a full-fledged PND (personal navigation device) which enables you to see where you are, find the places you need, put discoveries on the map, and it even comes complete with voice prompts. I am afraid I did not check out these advanced features, but I did explore the Singapore maps and I think it certainly beats the tattered street directory which I keep in my car’s glove compartment. This is the first time I used a touch screen and I really liked it. The screen is so sensitive and responsive I could key in my messages, and make corrections (which is very often), much more quickly. With the scrolling function, it was also much easier to find a name in the address book. Also I find that the images on the screen very bright and clear, and big. I like to take photos and videos of the fishes in my fish tank to show to Matthew, my friend’s adorable five-year-old son. With the 3.2” widescreen, the poor kid needn’t strain his little eyes anymore. For me this is the most important function of all. I will reject any mobile phone that does not take reasonably sharp photos. This is because I take a lot of photos for my blog when I am moving about and I don’t like to carry an additional camera. I was surprised at the high quality of the images taken on the X6’s 5 mp camera even under low-light conditions. Likewise the video quality was better than expected. I am afraid, I just did not have time to try out many of the other features that the X6 boasts; such as creating playlists and downloading games from the Ovi Store. Neither did I try updating my blog or Twitter (I don’t have an account) or Facebook (which I seldom access even from my pc). There are simply too many things to learn in such a short time. Even though I have been telling my friends that I embrace the new media because learning all the new stuff is supposed to be good for the brain and helps keep mental problems like dementia and Alzheimers at bay, I will have to do this another time. My biggest disappointment with this mobile phone was the messaging function. I don’t know, I just found it very difficult to get used to the functions and menus; and in fact I had to enlist my daughter’s help to send out my SMS’s the first time. But I guess the problem is with the user and not the product. But this was more than made up for by the really cool Contacts Bar which features thumbnail images for up to 20 close friends directly on the home screen. Generally, I was quite happy and impressed by the Nokia X6 and I think many seniors would take to it. But I repeat, if Nokia wants to target the seniors market, they must provide some hands-on training. Guess who is Nuffnang's featured blogger for the month of March? Have you seen this tiger? “Where it came from I can no longer remember, but it has been there since 1967 when I was posted home. I actually sent it to the Asia Pacific Brewery (Tiger Brewery) some years ago but have never had a response, but no big deal, who am I in the larger wheels of motion? So does anyone know where and when this photo was taken? This technically, is not a quiz because I myself do not know the answer.